She has a burn scar on her right forearm, and tattoos of angel wings on her back, spiraling flowers on her right side from her hip to her underarm, and a butterly on her lower left abdomen. Her ears are pierced. Blue jeans, a white t-shirt, a blue Florida Gators zip up hoodie jacket, and flip-flops. She was wearing a silver-colored watch, and wearing a necklace with diamond-type stones inset in a large cross (photo at right). Unknown. 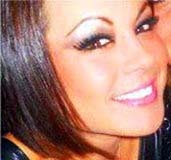 She was last seen dropping off her three-year-old twins with their father, her ex-fiance Dale Smith, Jr., at his home in southeast Orlando, Florida at Carter Glen Condominiums off Goldenrod Road. She was driving a black 2007 Hummer H3 with Florida license plate #AWGM26 (photos at right). A security camera filmed her arriving at the condo, and then driving away. A one-word text in response to a text from her brother was sent at 4:26 pm the same day, but her brother does not believe that Michelle sent the text herself as the one-word reply was uncharacteristic. Her vehicle was found the next day at the 4700 block of Walden Circle in Orlando, with its decals removed. Her cell phone was found in a lake a week later. Her whereabouts are unknown, and her case remains unsolved.